AKA Andrew Lamar Alexander, Jr. In law school, Lamar Alexander's roommate was Paul Tagliabue. He has spent his adult life as a lawyer, lobbyist, and Republican legislator. He worked as an assistant to Sen. Howard Baker in the 1960s, and was the White House Congressional Liaison under Richard M. Nixon. 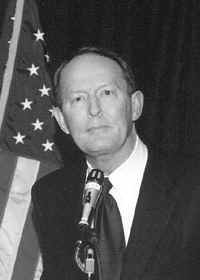 Alexander was elected Governor of Tennessee in 1978, and re-elected in 1982. When he was first elected, outgoing Governor Ray Blanton began issuing so many last-minute pardons it was widely assumed he had exchanged the pardons for bribes. With the cooperation of both parties (and a state Constitution that was vague on exactly when terms began or ended) the Democrats' Blanton was shown the door and the Republicans' Alexander took the oath of office three days early. After two undistinguished terms as Governor, Alexander became a lobbyist in 1986, and was named Secretary of Education under George H.W. Bush. He ran for the Republican presidential nomination in 1996 and 2000, posing as an "outsider" despite his lengthy insider résumé, but his polls peaked at 7% in 1999. Alexander has been a US Senator since 2003. Like most "public servants" on the national level, he is inexplicably wealthy. His official biography says he "co-founded" Corporate Child Care, but other sources suggest Alexander's contribution was little more than a $5,000 investment ("Captain Kangaroo" actor Bob Keeshan invested the same amount). Alexander has had no notable experience running any business, and has only practiced law sporadically, but as of 2003, his net worth was almost $5 million.